An Airbus A320 operated by Germanwings was destroyed in an accident in a mountainous area in southern France. All 144 passengers and six crew members were killed. Flight 4U9525 departed Barcelona, Spain at 10:00 hours local time (09:00 UTC) on a regular passenger service to Düsseldorf, Germany. The flight reached its cruising altitude of FL380 at 10:27 hours. At 10:30 hours the flight was cleared direct to the IRMAR waypoint, which was confirmed by the flight: "Direct IRMAR, Merci 18G." This was the last radio contact with the flight. At 10:30:08, the captain told the co-pilot that he was leaving the cockpit and asked him to take over radio communications, which the co-pilot acknowledged. At 10:30:53, the selected altitude on the Flight Control Unit (FCU) changed in from 38,000 ft to 100 ft. One second later, the autopilot changed to OPEN DES mode and autothrust changed to THR IDLE mode. The aeroplane started to descend and both engines' speed decreased. At 10:33:12, the speed management changed from managed mode to selected mode. One second later, the selected target speed became 308 kt while the aeroplane's speed was 273 kt. The aeroplane's speed started to increase along with the descent rate, which subsequently varied between 1,700 ft/min and 5,000 ft/min, then was on average about 3,500 ft/min. The selected speed decreased to 288 kt. Then, over the following 13 seconds, the value of this target speed changed six times until it reached 302 kt. At 10:33:47, the controller asked the flight crew what cruise level they were cleared for. The aeroplane was then at an altitude of 30,000 ft in descent. There was no answer from the co-pilot. Over the following 30 seconds, the controller tried to contact the flight crew again on two occasions, without any answer. Thereafter the selected speed increased up to 323 kt. Then the buzzer to request access to the cockpit sounded, but the copilot did not react. Marseille control centre kept attempting to contact the flight, without any response. The selected speed was again increased, this time to 350 kt. Meanwhile the captain attempted to call the copilot over the interphone and there were noises similar to a person knocking on the cockpit door. At the same time Marseille control and a controller from the French Air Defence system called the flight at various frequencies, without success. As the aircraft kept descending noises similar to violent blows on the cockpit door were recorded on five occasions between 10:39:30 and 10:40:28. The GPWS then sounded: "Terrain, Terrain, Pull Up, Pull Up" until the aircraft impacted a sloping rocky ravine in mountainous terrain at an elevation of 1550 meters. - the lack of clear guidelines in German regulations on when a threat to public safety outweighs the requirements of medical confidentiality. 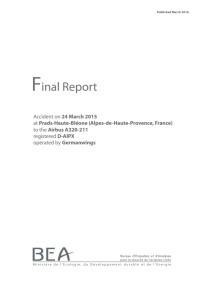 On 6 May 2015, EU Transport Commissioner Violeta Bulc asked the European Aviation Safety Agency (EASA) to set up a task force to look into the findings set out in the preliminary BEA report. The Task Force consisted of 14 senior representatives from airlines, flight crew associations, medical advisors and authorities. On July 17, 2015, the Task Force published their report, which contained six recommendations for the European Commission, primarily calling for better checks on crew members. CAT.OP.MPA.210 of Regulation (EU) No 965/2012 stipulates that flight crew members required to be on duty in the flight crew compartment shall remain at the assigned station, unless absence is necessary for the performance of duties in connection with the operations or for physiological needs, provided at least one suitably qualified pilot remains at the controls of the aircraft at all times. In such cases, the Agency recommends operators to assess the safety and security risks associated with a flight crew member remaining alone in the flight crew compartment. If the assessment leads the operator to require two authorised persons in accordance with CAT.GEN.MPA.135 to be in the flight crew compartment at all times, operators should ensure that: (a) the role of the authorised person, other than the operating pilot, in the flight crew compartment is clearly defined, considering that his/her main task should be to open the secure door when the flight crew member who left the compartment returns; (b) only suitably qualified flight crew members are allowed to sit at the controls; (c) safety and security procedures are established for his/her presence in the flight crew compartment (e.g. operation of the flight deck, specific procedure for entry, use of observer seat and oxygen masks, avoidance of distractions etc. ); (d) training needs are addressed and identified as appropriate; (e) safety risks stemming from the authorised person leaving the passenger cabin are assessed and mitigated, if necessary; and (f) resulting procedures are detailed in the Operations Manual and, when relevant, the related security reference documents. Distance from Barcelona-El Prat Airport to Düsseldorf International Airport as the crow flies is 1159 km (725 miles).